Upcycle House is part of a large development project created by Realdania Byg called The MiniCO2 Houses. The project includes six detached houses, each designed to reduce carbon emissions from the construction, operation and maintenance of a house. Upcycle House investigates how materials can effectively reduce the carbon footprint in the building industry. The load bearing structure consists of two prefabricated shipping containers with recycled aluminium roof and façade, composite boards made of plastic and waste wood that clad the terrace, and insulation made with torn styrene from packaging waste as well as granulated, treated newspaper. The flooring of the kitchen consists of discs made from champagne cork plugs and the exterior façade made with Richlite solid paper composite. The use of recycled and sustainably sourced materials are not very visible in the final aesthetic, and the house does not radiate a recycled look. 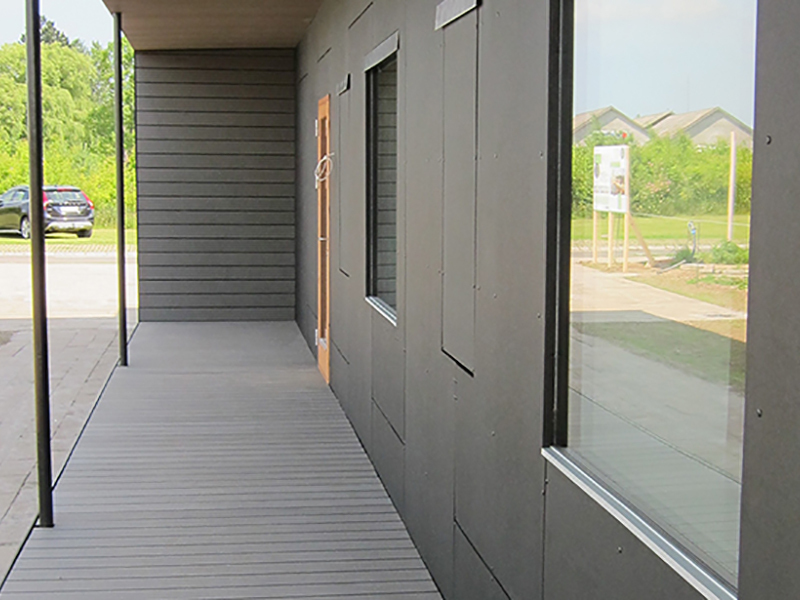 It looks and functions like a contemporary house built of conventional materials, but the Upcycle House results in significant CO2 savings of up to 86%. Upcycle House aims to reduce emissions further by using passive properties such as orientation, temperature zones, daylight optimisation, shading and natural ventilation.